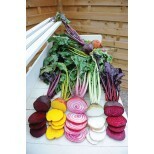 Visually stunning 5 variety beetroot mixture; also available as separate colours. Wash young roots, peel and slice raw into salads to add colour.The stems and leaves make excellent salad ingredients, but can also be steamed. 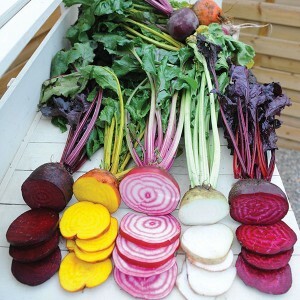 Baby roots are ideal for pickling, whilst mature roots can be steamed. Sowing Sow thinly outdoors, 13mm deep in drills 30cm apart. Sow at 2-3 week intervals until mid-summer. Growing Thin seedlings as necessary, to 2.5cm apart for 'baby beets' or slightly wider spacing for larger roots. Keep well watered for most tender roots and to avoid bolting (running to seed). Both the roots and the leaves are edible, raw or steamed when young.